I’ve been asked by a number of people “why, as a website developer, did I make the switch to using the New Rainmaker Platform?” I figured it would be best to write this review post as many people I know wonder if they should make the switch and it may help them make their decision easier. I’ll review the main reasons why I chose to move to Rainmaker last October and I’ll also cover some of the pros and cons, as this WordPress hosted platform isn’t for everyone. Scribe is already a part of Rainmaker so there’s no need to purchase a separate subscription. Saves me an extra $97/month. I’m going to be re-evaluating my past posts to increase my SEO juice. Makes things a lot easier. With the built in shopping cart and payment system, I don’t have to hassle with updates and new versions of shopping cart plugins. Again, no need for extra plugins and software. Set up various affiliate levels for each of your programs, courses, memberships. Quickly make special coupons for tracking sales from different avenues or set up a “members-only” coupon for access to special areas of your site or content on your page. No need to sign up for a security certificate and worry about how to add it to your hosting account. Just a quick email to support and they’ll activate it for you. Included as part of your account. No need for multiple logins for my free optin gifts and my member courses. All are contained within the Rainmaker backend. I can give access to multiple products/content depending on their membership levels. No need to mess with other forum plugins as they have built in forums. Ready to match your theme. Set up and go. Ease of management with built in tools for my membership area and free library. Before moving to Rainmaker, I had 3 separate sites set up. One was my main site, another was for my membership area, and the third was for my training program sales page. Reducing the amount of time I spend “tinkering” with code, plugins, redesigning my theme, etc. Rainmaker is a hosted WordPress solution. Meaning they take care of all the updates, plugin management of basic core plugins for their system, and updated Genesis Child themes built right in. This was a major selling point for me. As a website designer/developer it was super important that I still keep my site branded the way I want. Since I already work with Genesis Child Themes, this was super easy to do. I just created my theme and submitted it to Rainmaker to upload to my account. It usually only takes about a week to get approved. The way the themes are set up within Rainmaker, it limits the amount that I can futz with my site. In the past 16 years, I’ve redesigned my sites at least a dozen times and done some sort of minor revisions at least twice that. Since all new theme designs need to be uploaded and then approved by the Rainmaker team, it is a lot more work to go through the steps to do any types of redesigns. You do have access to modify the CSS of your theme, but you’re locked out of the functions.php file as well as any page template files. For me, this was actually a good thing as it shifted my focus to working on content and client projects rather than the distraction of messing with my own site, since I now have limited access to my theme. Since it is a hosted WordPress solution, you aren’t able to upload extra plugins. Everything you’d need is contained within Rainmaker. This does limit some functionality, however I’ve found that most everything I need is already built in. Podcasting is something that I’ve been considering starting for the past year. When I’m ready to pull the trigger on it, Rainmaker has all the features built in and ready to go such as great file hosting, pushing to iTunes, etc. No need for a subscription to third-party apps like Leadpages. Rainmaker has wide assortment of pre built landing pages, sales pages, optin pages, etc. Pretty much, plug-in play. Test your conversions with A/B split testing right from inside Rainmaker. Easy to read statistics right when I log into my admin area. From traffic stats to sales statistics. Whenever I’ve had any issues, I can email the support team and get a timely response. They are more than happy to help in any way. As a member, you have access into the Copyblogger community forums. There is a wealth of information in there and the community members are extremely helpful. Also as a member, you have access to the Authority Training and Forums. Priceless information to business owners and bloggers. Ability to send your content right to social channels from inside Rainmaker. This was a biggie and I’m looking at transferring my course materials that were originally set up in post styles to the LMS area. This allows you to set up specific modules that can be checked off by your members when they complete the sections. Great for tracking and seeing that members are actually consuming content. I’m still on the fence about this one however if it works out, it would mean that I could move my list from Aweber and save myself the extra $20/month. Not sure when this feature will be integrated but I’ll probably test it out. So those are the reasons I moved to Rainmaker. I did want to cover the cost savings as well for those who are big into the numbers. For me, it was a no-brainer. I’ll admit that there are times when I re evaluate going back to the do-it-myself route, especially if I see a great plugin that I’d like to try, but I always come back to the fact that I’m trying to run my businesses as simply as possible and if I went back to the old way, it would be a lot more time consuming! I do want to let you know that Rainmaker isn’t for everyone. At $97/month it is a bit higher than most hosting platforms and there are limitations as I’ve mentioned above. I think that for many business owners who are looking to do some major content marketing, this is the ultimate weapon for you to help streamline your process. For those who just need a simple site, without all the bells and whistles, Rainmaker might be overkill. Also, if you like to have full access to your theme files or need specific plugins for your website to run the way you want it to, the inability to access theme files and add plugins to this platform is a deal killer for you. So hopefully this helps if you’ve been on the fence about making the switch. For those of you who are still unsure, I’d suggest you take it for a spin. They have a free 14 day trial and it should give you time to get in and take a look around. If you have any questions about anything, feel free to ask in the comments or contact me and I’ll do my best to help get you answers. 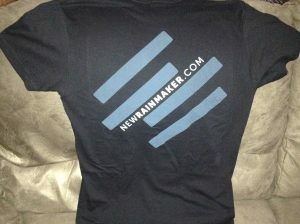 As of January, I’ve moved my site from the Rainmaker Platform. Not because I don’t think it is an excellent platform, it’s only because it wasn’t what was needed for my business at this time. Since I switched gears back to offering website development and strategic direction, the many features offered in Rainmaker weren’t necessary. Jenn simplifies online marketing & website development for service-based business owners. She is also the author of: Online Marketing Simplified: The Beginner’s Guide to Using the Internet to Market Your Local Business. When she's not busy working, she enjoys reading, riding horses & playing with her 3 boys. Thanks for your review. 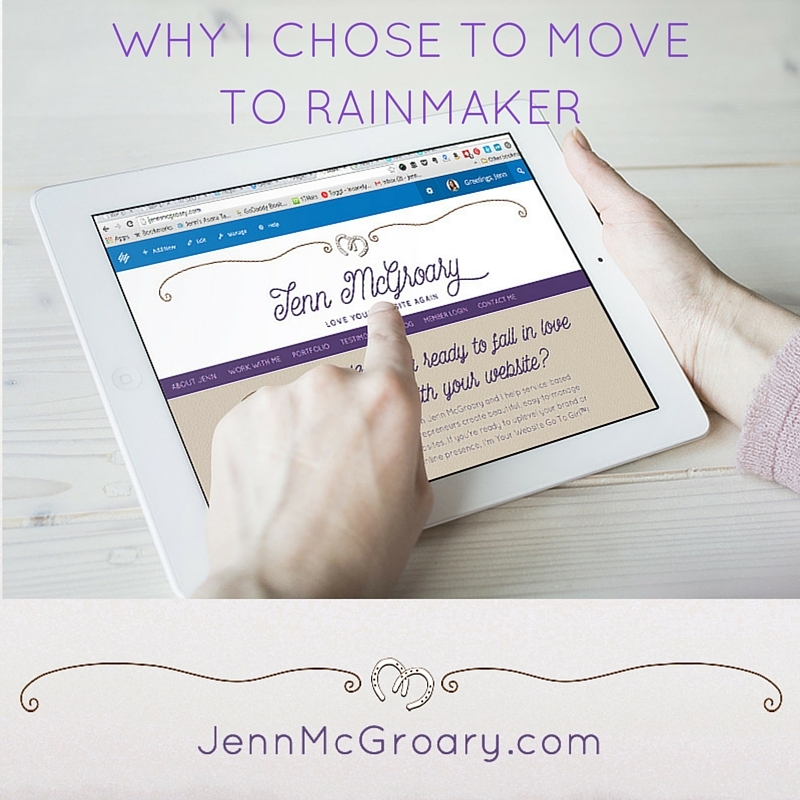 I worry about leaving Rainmaker if I decide it’s not right for my business. How difficult was it to move your site back to WordPress after Rainmaker? Or was it a non issue because your business essentially changed so you weren’t having to migrate everything? Valid question. The main issue would be if you’d used the built in landing pages. The styling for that might not carry over when you move the content to a self-hosted solution. Another aspect that I hadn’t tried yet, as it was a new feature before I transitioned away from The Rainmaker Platform, was that any courses/modules you create in the LMS, might not transfer over either since they are custom post types. For me, I had most of my content created as pages with special access depending on membership level, so when I transferred the content back to my hosting account, I just needed to reassign the pages. I also have an older version of Premise, which is what the Rainmaker Platform uses to control membership access levels for pages/posts/content. The question I get asked most often… How much will the website cost? I donate a percentage of all of my project fees towards helping women entrepreneurs in other countries. You can help. Click the logo above to see some of these amazing women and you can learn how to start donating too!